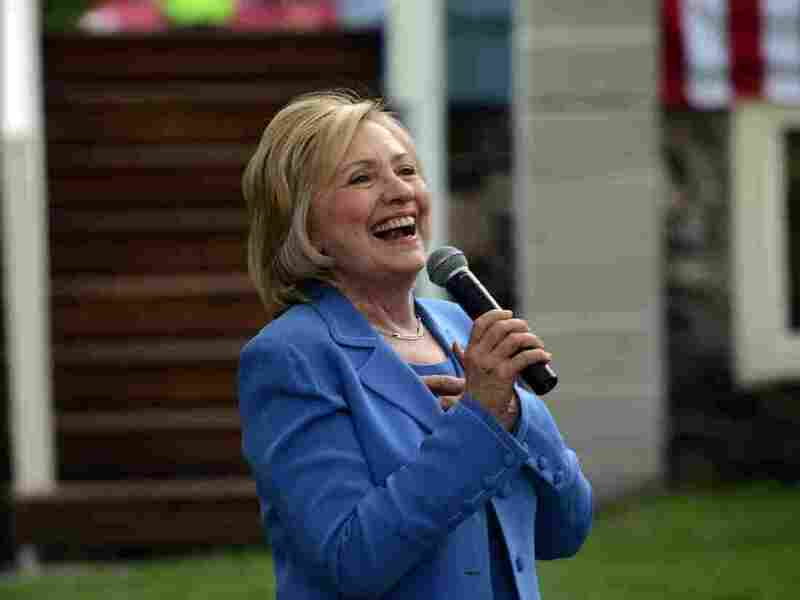 Is Hillary Clinton 'Likable Enough'? : It's All Politics A new round of polls in key swing states showed Hillary Clinton's favorability ratings suffering badly. It's a warning sign for Clinton's campaign, but also for politicians generally. New polls show that voters in key swing states view Clinton unfavorably — by a wide margin. Barack Obama said before the New Hampshire primary during his contentious primary with Hillary Clinton in 2008 that she was "likable enough." The quip got him in trouble with Clinton supporters, but Clinton's likability is at the heart of her candidacy in 2016. Clinton has a massive lead among Democratic candidates, but polls out in key swing states Wednesday raise warning signs for her candidacy. Is that bad? Some perspective: In Colorado and Iowa, her unfavorable scores are close to those of Donald Trump, perhaps the most polarizing candidate on the trail and the Republican with the worst favorability numbers in the poll. By comparison, more voters rated Scott Walker and Marco Rubio favorably than unfavorably in all three states. Jeb Bush, meanwhile, was viewed more unfavorably in Colorado and Iowa, but didn't have any gaps the size of Clinton's. To be clear, these are early polls. Many voters just aren't paying close attention to the campaign yet. Democrats are pushing back. "I don't think the poll is accurate," Democratic pollster Geoff Garin, who was a top strategist on Clinton's 2008 campaign, wrote in an email to NPR. He added, "Her standing is better than the [Quinnipiac] polls suggest," adding that these numbers are "inconsistent with other polling." Still, other polls do reinforce that Clinton may have a perception problem. In several swing states, voters don't think she's honest or trustworthy — Coloradans, Iowans and Virginians all said by wide margins that they don't consider her honest or trustworthy. In a Quinnipiac poll from June, voters in three other states — Florida, Ohio and Pennsylvania — were also more likely to find her untrustworthy than trustworthy. This sentiment extends beyond swing states, as well. In a June nationwide CNN poll, 57 percent of voters said they didn't find Clinton trustworthy. A barrage of news stories generated since the start of the campaign haven't helped — her use of a private email server during her time at State, questions about whether Clinton foundation donors were seeking political clout, and her evasion of the press (including a notorious moment when the campaign literally roped members of the media away from the candidate) all could contribute to a narrative of a candidate who's being less than transparent. For her part, Clinton has said she believes voters can see through these sorts of narratives and still lend her their support. "[A]t the end of the day, I think voters sort it all out," she told CNN in June. "I have great confidence. I trust the American voter. So I trust the American voter 100 percent, because I think the American voter will weigh these kinds of accusations." It's not just a trustworthiness problem: Quinnipiac has found that in six swing states, voters are either split or negative on whether they believe Clinton cares about their needs and problems. So what's a candidate to do? For one thing, have realistic expectations about changing people's minds, one pollster said. "At this point, for somebody like Hillary Clinton, who's been in the public eye for so long, you're just not going to change some of these perceptions," said G. Evans Witt, principal and CEO at Princeton Survey Research Associates. "You're not going to move the Republican numbers on Hillary Clinton as trustworthy. That means there's only a limited range for improvement, no matter what she does." One other step: Focus on her strengths. Clinton has one bright spot that pops up in state after state in these polls — her leadership skills. Even when voters view her unfavorably, think she doesn't understand their problems, or say she's untrustworthy, they also view her as a strong leader. And if she does need to clear a likability (or trustworthiness) hurdle — and, importantly, those are two very different things — focusing on her leadership strength could be how she does it. "Honest and trustworthiness are virtues that we all aspire to, but we are not talking about, 'Are we going to marry somebody?' We're talking about electing a person to president of the United States," Witt said. "You want to feel that the person you're supporting for the president is competent. And that is, I think, the emphasis that you're going to hear from the Clinton campaign." In fact, simply emphasizing her leadership credentials and skills could be a way to make people feel that Clinton is more trustworthy and authentic. "[The campaign] should use that leadership as an opportunity to speak bluntly and authentically about the issues that actually matter to people in the country," Democratic strategist Craig Varoga said. "If she speaks — not demagogically, but speaks bluntly — I think there will be a very positive reaction to that." Varoga adds that there is one other important thing to remember when looking at any poll about how voters feel about 2016 candidates. "This is in many ways a completely lousy time to run for president," he said. Frustration with politicians is off the charts, he added, and that means well-established candidates like Clinton and Republican Jeb Bush are facing a testier electorate than candidates in previous races have faced. "There's a very high level of dissatisfaction with the status quo," Varoga noted, "and there's a very large minority inside each party that wants something completely different." This has helped candidates like Bernie Sanders and Donald Trump post high numbers in polls, Varoga says. And that support itself hints that, for Clinton or any number of mainstream Republican candidates, making voters like them could just be tougher this time around.